For the second year in a row, I have the exciting job of launching our Christmas campaign. While we’re bringing back fan-favourites, such as the truck tour and timeless ‘Holidays Are Coming’ advert, there are plenty of firsts this year too, which will help get the nation in the festive spirit over the coming weeks. Yes! It’s back. I want to start with this because it’s a firm favourite. For me, it’s incredible to see how much love fans have for the advert – they write to us specially to ask when it’ll appear on TV. Fans tell us that doesn’t matter if all the decorations and lights are up in the shops, it’s not Christmas yet until they’ve seen the ad. The much-loved truck tour is also back, but with some added sparkle! The tour is incredibly popular, we get hundreds of questions on social media asking when it’ll start and what cities it’ll be visiting. And this Christmas we’ve decided to make it even more magical. At each stop, visitors can explore a winter wonderland, before enjoying a free sample of Coca-Cola Classic, Coca-Cola Zero Sugar or Diet Coke. Then when the sun sets, the truck will come to life. You’ll start to see little twinkles, a little bit of snow falling, and then a special animation on the side of the truck will gradually unfold. Without giving too much away, it’s all powered by the crowd’s seasonal goodwill. The animation will eventually reveal what’s inside the truck, as well as some additional surprises. The Coca-Cola Christmas Truck will be stopping at 44 locations up and down the country, so there’s plenty of opportunity to get your photo taken with the iconic red vehicle. But if you’re very lucky, you may get to win a personal visit to your home through our on-pack promotion. Not only that but you’ll also receive a Santa sack full of goodies worth £5,000. Last year someone in Glasgow won, however the truck was back in London at the time. So it made a lengthy trip all the way up to Scotland. But it was well worth the drive. The winner invited all of his neighbours, friends and family. He had about 30 people in the end! They all loved it. Find out more about the ‘Win a truck stop’ competition. One of our firsts this Christmas is our truck emoji. It’s the first time we’ve done this here, and we’re really excited for people to engage with it. Just use the #holidaysarecoming hashtag on Twitter, and it’ll come up with a little emoji of the Coca-Cola truck. We get a large volume of tweets from fans about the truck tour, so hopefully this will be a nice surprise. Take a look at some of our favourite fan reactions to the truck emoji. We'll be the headline sponsor of Capital's Jingle Bell Ball for a third year now. It's held at London's iconic O2 Arena, and features some of the music industry's most popular acts, from Ellie Goulding to Calvin Harris and Little Mix. We'll have ways for fans to win tickets, and will be bringing the action to those who can't make it via social media. It's just great to be part of one of the biggest Christmas parties of the season. Check out what happened on the red carpet at last year's Ball. 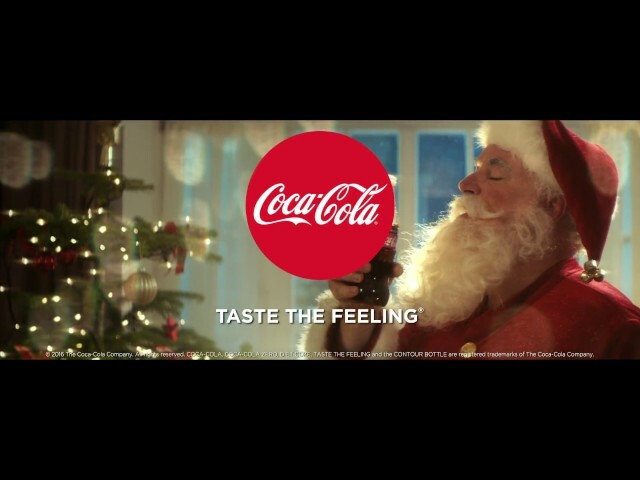 This year we’re launching a new TV advert called: ‘A Coke for Christmas’. It’s all about celebrating the joy of giving over the festive period. It shows how Christmas is not just about giving gifts or material possessions, it’s about spending time with your loved ones and showing you appreciate them with simple gestures – like giving someone a Coke to say thank you or by donating some money to charity. A perfect example of this is the work we’re doing with FareShare, a UK charity that tackles hunger and food waste by redistributing surplus good food (that would otherwise go to waste) to those who need it most. We’ve been donating our surplus drinks to FareShare for several years, but this Christmas we’re doing something extra. When you buy a bottle of Coke with the FareShare logo on it, and upload a photo to our website, we’ll give 25p to FareShare – which is the price of one meal. We're calling this our 'Snap to Donate' campaign. Find out more about our partnership with FareShare. I’m really pleased that we’re bringing back Designated Driver for the 9th year in a row, which is run in partnership with the Department for Transport’s THINK! Drink Drive campaign. We think it’s important to support local communities, and believe that the designated drivers of the party season (i.e. those who offer to do the driving and stick to soft drinks on a night out) deserve a little treat too. So if that’s you this Christmas or New Year’s Eve, we’ll give you a free second soft drink when you buy a Coca-Cola Classic, Diet Coke, Coca-Cola Zero Sugar, Appletiser or Schweppes drink at participating pubs and restaurants. We’ve got a jam-packed Christmas campaign, and I can’t wait for everyone to start discovering all the activities we’ve got planned. I personally love how excited everyone gets, and often check out all the user-generated content on social media - it’s wonderful to see what we’ve been planning for months come to life and be enjoyed by many. Find out more about our Designated Driver campaign. Louise Maugest is a Senior Brand Manager in our marketing team at Coca-Cola Great Britain. She’s been with the company since 2014, and relocated from our Paris office to London.